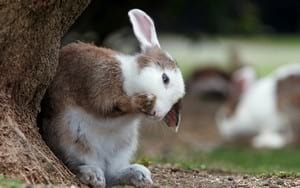 You might be surprised to hear that rabbits can be easily trained to use a litter box. In fact, bunnies are pretty clean animals by nature. As such they make for wonderful indoor companions. Basically, bunnies have their own preferred corners for eliminating, it is up to you to find them and put the litter tray there. You can start to litter train a rabbit at any age. Contrary to what you might think it is actually easier to litter train older rabbits. The reason for this is that a rabbit’s attention span and ability to learn increases as they grow up. This also means that if you have a baby rabbit you will probably need to put in a little bit more effort. 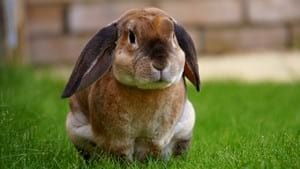 This might sound like a bit of unusual advice but rabbits that are neutered or spayed are easier to litter train. The reason for this is that when bunnies reach the age of 4-6 months, they will generally begin marking their territory as hormones start to become active. If you see that your pet rabbit all of a sudden starts pooping/spraying everywhere it can be linked to territorial behavior. Spaying/neutering can help in order reduce these feelings and increase the likelihood of using the litter pan. Even if you intend to let your bunny roam through the house, you need to start small. The reason for this is that being confined to a small area will help a rabbit to find the litter box. The biggest mistake people make when litter training is giving the rabbit too much freedom, too soon. 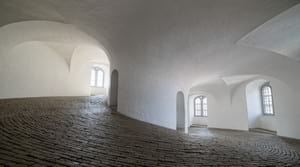 Ideally, you start off in a room that has a floor that is easy to clean. In other words an area with tiles or linoleum like for example a bathroom or a utility room. Begin by keeping your rabbit in a generous cage or hutch. You can even use a pen to offer a bit of running space. Place a litter box in a corner of the cage. If you have a running space add one or more boxes. Keep an eye one where your rabbit urinates and if it is in a place that does not contain a box, move an existing box to that location. 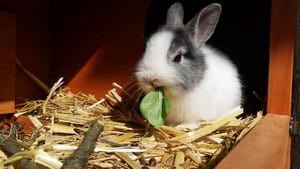 You can help establish the habit by gently herding your rabbit back to a litter tray if you see the tail being lifted in a corner where there is no box. A small amount of hay in the litter box can help to attract your bunny and spend time there. Most rabbits like eating on their tray and some even sleep there. Typically most rabbits will choose a limited number of preferred spots for eliminating. So you basically you need to find where your rabbit enjoys to deposit urine and most of its poops and put a litter box there. Usually bunnies will pick corners so these are good starting locations for placing the litter boxes. Don’t be surprised if your pet rabbit needs to have a couple of litter boxes. Reason for this is that rabbits may eat in one and pee in another. A cage is a good way to limit the amount of free space your bunny has when you start litter training. 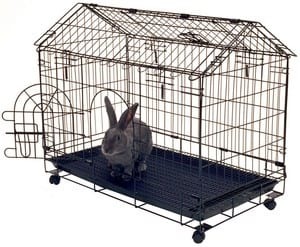 Just make sure the cage is big enough to contain your rabbit’s food, water, and litter box while still allowing for space to move around and stretch. If your cage is rather small you can provide a bit of extra running space by using a pen. Make sure to also foresee a litter tray in the pen area. Corners of the cage or pen are a good place to start when choosing a litter tray location. When starting the training it is best to provide a couple of litter boxes. This will help your long-eared friend in finding its preferred location(s) for eliminating. 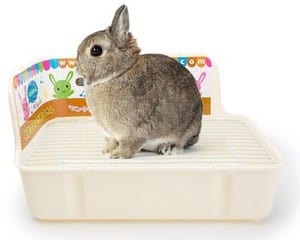 Once your rabbit has gotten into the routine and uses fewer boxes, you can opt to remove some of the early “training” boxes. As rabbits are diggers, they can kick their litter out of the box. In addition, they might back up in the corner so far that they urinate over the edge. Getting a box with higher edges or a cover can help to control these problems. When starting litter training ideally you want to encourage your rabbit to spend time in the litter box. This way when your bunny eliminates it will already be in the correct place. A great way to get a rabbit to stay in the tray for a while is by filling it with some fresh hay. In a lot of cases, rabbits will even sleep in their litter box. 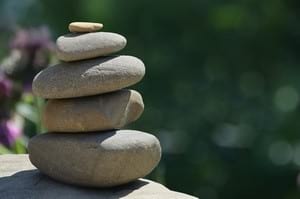 Certainly, in the beginning, it is important that you try to actively encourage good behavior. If you spot your rabbit is about to go outside of the litter box, try to avoid this by gently herding her/him back in one of the available boxes. You can also verbally praise and offer a treat if the tray is used correctly. 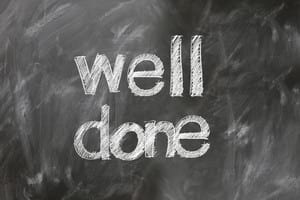 Always apply positive reinforcement as you don’t want the litter box to seem like punishment. As with most training patience and persistence are key. Give your bunny time to develop its litter habits. Don’t get discouraged too soon, some accidents are likely to happen. When they do, make sure to clean up right away as otherwise, you risk that your rabbit starts to associate that spot with going to the toilet. Use a spray bottle filled with white vinegar as this is very effective at removing rabbit urine. 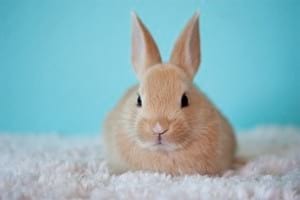 The litter box should be cleaned regularly in order to avoid that your rabbit sits in its own urine. 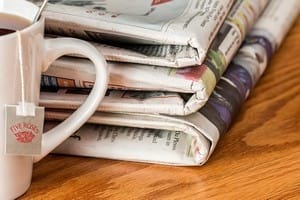 Place a couple of newspaper sections at the bottom of the box underneath the litter. This helps to absorb the urine and keep the litter and tray clean. Typically you will need to change the litter every other day. For smaller litter boxes you might want to change it every day. The actual frequency depends on a number of factors: the size of the rabbit, the size of the litter box and the current diet (eating and drinking). For example, when it is warmer your bunny will drink more and as a result, urinate more often. Once you see that your bunny has learned to consistently use the litter box(es), you can decide to gradually offer more space. However, don’t hurry this process! If you see that your rabbit starts “forgetting” to use the box, reduce the free space so that the earlier habit resumes again. If the area in which your rabbit can roam around freely becomes big you might need to include extra litter trays.